Vicenza Black is made by Neptune and is a marble effect wall and ceiling panel that makes a bold and definite statement wherever it is used. Being waterproof, it is ideal for use in bathrooms, showers, kitchens and utility rooms and can be used on walls or ceilings. The cladding is made from a hollow section PVC that has a tongue and groove jointing system, providing a flush effect finish. 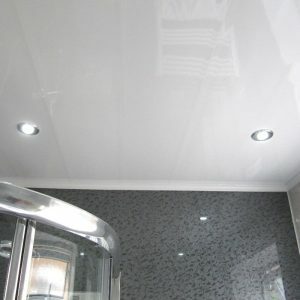 Its smooth, gloss surface is easy to clean and requires no maintenance. Decos Trims can be used with these panels (except Decos Infill Strips which do not work with Vicenza). The gauge of the PVC used on these panels is quite thick – so much so that we do not recommend that you attempt to bend these panels to follow a curve. Even though Vicenza was introduced as a budget range we have been very impressed with the quality of this range – they are extremely well made and they look superb. I think that these are the best value panels available on the market at the moment.